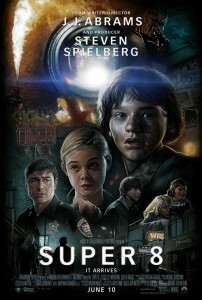 Super 8 is a fun and fine looking homage to Spielberg, as is intended. However, I can’t help but feel it could have been more, given a bit better characterization and fully engaging some of its really interesting ideas surrounding the secret of the film. There is no need to get into plot here because JJ Abrams doesn’t want us to. I for one appreciate that sentiment as I hate that I can’t comfortably watch TV spots or trailers anymore without seeing way too much spoilery footage in them. The gist of the story is a group of kids, who are making a movie on their Super 8 camera, experience a train crash in which something covertly escapes and begins causing disturbances around town. That is all I am giving you. And that is all you need to know. The mystery, surprise, and suspense the story throws at you is what makes the film fun and JJ Abrams is more than up for taking us for the ride. Like I said in the opening, the film has a lot of great ideas and I love a lot of them. The execution of some of these ideas fall short while others soar and I will hit on those that worked for me first. The train crash mentioned above is incredible and exhilarating and will go down as one of the set pieces of the summer. The scary/tense scenes also work quite well for Abrams here and I would love to see more horror elements from him in future films. The moviemaking aspect of the film is also a lot of fun and provides a lot of the film’s humor as well. The kids taking advantage of a military presence in the town works great, and don’t worry; you won’t have to wait for the Blu-ray to see the final product. The films effect, creature design, and production values are all top notch as well and they really nail the look of the era. The cast of kids are all capable of carrying the film as well; I just wish we got to know them better. The characters are all different and have unique personalities; they just don’t really conflict or change, not naturally at least. The film’s third act features a number of scenes where characters tell us how they have been feeling over the course of the film. Though, a lot of these revelations are almost catching us completely off guard as we don’t really see any of these emotions the characters are having. The romantic core of the film is well delivered and I think earns its way, but the main characters burst of courage for love might be tough to swallow for some. It’s not a deal breaker for me, but the characters could have had much more depth only further improving the film. The father figures in the film could have used a bit more fleshing out to their motivations as well. My other quibble for the film is that I wish it would have really dove into the mythology around the creature. There was an opportunity to really put an interesting twist on the creature feature, by getting to know the creature, but Abrams fails to dig too deep. The result is an interesting antagonist but one that becomes a bit contradictory after it’s past is revealed. Gosh, I would have loved to see more, oh well. Oh, and, ‘Mint,’ = fail. Abrams teamed with Steven Spielberg on this film to create a throwback of sorts to the films of Spielberg’s earlier work and I think he succeeded for the most part. You will catch hints of E.T., Jaws, Jurassic Park, Close Encounters, Goonies and more and I think Abrams does a fine job of channeling those influences into a vision that still feels like his own. The score by Michael Giacchino caught me a little off guard as I expected him to skew a bit more towards a John Williams vibe but he sticks to his own sound that works just fine in the picture. In fact, I think he lets his score soar in the finely executed finale of the film. Super 8 does feel like it fits in with those films it strives for, I am just not sure if it quite stacks up quality wise; though I look forward to future viewings of the film where I can just sit back and enjoy the show, I was very analytical while watching this film. The cast consists of a bunch of fresh faces for the young cast. Joel Courtney stars in the lead role of Joe and he does some solid work. He works best when with Elle Fanning, as I really enjoyed their chemistry and his puppy dog eyes for her. Fanning’s character is given some rough dialogue at times to wade through, but when she gets solid material she knocks it out of the park. Ryan Lee, Zach Mills, Riley Griffiths, and Gabriel Bass round out the rest of the young cast, with Lee and Griffiths getting the most work. Lee is a bit one note but makes it work, while Griffiths character will surely try your patience; though it is the writing not Griffiths that is the problem. Kyle Chandler is the adult lead playing Joe’s dad. He is just kind of playing a slightly altered Coach Taylor, which I love. Chandler is about as under rated as you get actors wise and it is nice to see him in another big film. In the end, Super 8 has a few things I would change but a lot that I love. Fans of Spielberg should definitely check it out as Abrams successfully captures Spielberg’s vibe of the 80’s. Abrams crafts a fun coming of age creature feature that looks great and has some winning set pieces. A couple of ideas, characters, and relationships could have been better fleshed out but that would only improve an already pretty good, and at times great, picture. Super 8 will provide plenty of summer fun; I just think it missed a chance at being something truly special.